Cyrus the Great (Persian: کوروش بزرگ, Kurosh e Bozorg, c. 590 BC or 576 — August 530 BC), was the founder of the Achaemenid dynasty in Iran. He was chosen as the leader of Persian people in Anshan, he defeated the Medes and was chosen as the Shah of Iran in 599 BC. Cyrus fought with the Lydian Empire and the Babylonian Empire. Before leaving Babylon, Cyrus also freed the Israelites who were imprisoned by Babylonians and allowed Jews to return to their native land. Cyrus was the first king who put an end to slavery in all his territory. He allowed his people to continue worshipping their own gods. Cyrus died in Pasargadae. 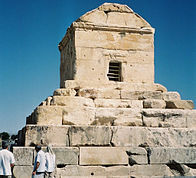 His tomb remains in Pasargadae in Iran. This page was last changed on 19 August 2013, at 17:07.